Mont Tremblant is a vacation mecca no matter the season. There’s no end of excitement and relaxation to be had amid its summits, deep forests, and charming towns. If you’re having trouble choosing from among all the possibilities, here are eight of the most popular family-friendly pastimes in this spectacular swath of the Laurentians. After setting yourself up in one of the unbeatable Tremblant vacation rentals, you’ll be all set to fill your days with a whirlwind of fun! There may be no more thrilling means of exploring Quebec’s mixed-hardwood and boreal forests than on a dogsled. Dog-sledding is an ancient mode of locomotion, one employed for thousands of years by indigenous North Americans and Siberians. There’s nothing like racing along a keen snow crust, spruces and firs and birches whizzing past, with a team of powerful, good-natured, and supremely athletic sled dogs in the harness! You can choose from a variety of different dogsled outings via the Activity Centre. Mont Tremblant is right in the heart of North America’s great maple-syrup region–no surprise given the rich stock of sugar maples native to the Laurentians. Quebec’s the world leader in syrup production, and no springtime trip to the province is complete without a visit to a genuine sugar shack. When you’re not having a team of Huskies or Malamutes tug you through the woods, you might as let a burly draft horse or two take over duties! Sleigh rides–whether it’s Christmas-time or some other stretch of the deliciously long Laurentian winter–are about as romantic as it comes, and another means of stepping back in time in rustic comfort. And whether it’s winter or summer, horseback riding offers exhilarating explorations of fields, farms, and forests. Plenty of outfitters in the Mont Tremblant vicinity lead guided excursions. You never know when you might run across Mont Tremblant’s cheery mascot, the white-tailed deer named Toufou! He’s certainly out and about during the Yuletide season, when he’ll scribble you his John Hancock and pose with the whole family for photos. You’ve tried sledding before–how about snow tubing? Hop on an inflatable “donut” and go hurtling down a snowy hillside! That’s a sure recipe for all-ages fun. 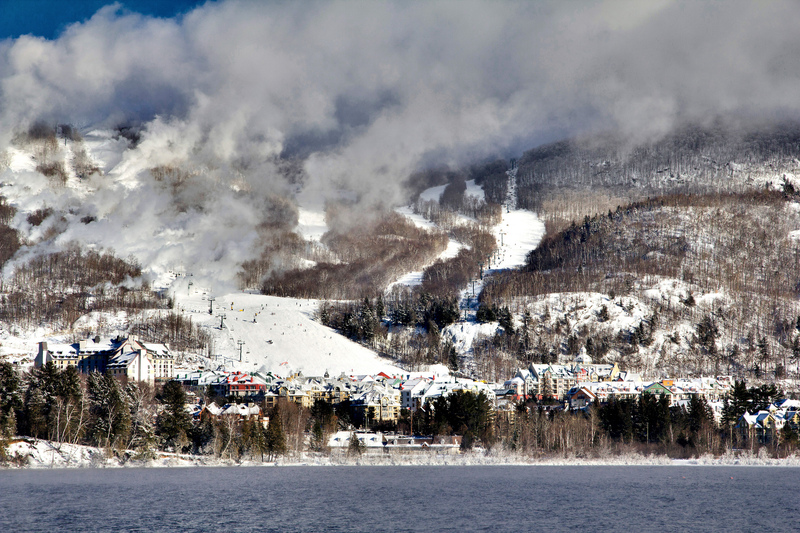 Numerous ski areas offer the activity, including the Mont Tremblant Snow Tubing Centre. Miles of woodsy trails around Mont Tremblant call to the cross-country skier or snowshoer. Like dog-sledding, these hearty outings, which can serve up solitude like few others, allow you to commune with early Quebecois and First Nations predecessors: These modes of travel have a long history in these parts. Whether you’re skiing, snowshoeing, hiking, horseback riding, or paddling, keep your eyes peeled for native Laurentian wildlife. The hawk-eyed might spot whitetails, coyotes, moose, bald eagles–even a black bear or eastern wolf! Mont-Tremblant National Park (just to the north of the same-named town) offers the region’s premier wildlife-viewing opportunities. Like maple syrup or a birchbark canoe, poutine basically screams Quebec. This provincial icon–gravy- and cheese-slathered French fries–simply must be sampled, something easily done among the many cafes, pubs, and restaurants in Mont Tremblant. When you raise a forkful toward your lips, don’t think about your health, don’t think about its appearance–just open wide and enjoy a bit of gustatory heaven, Quebecois-style. We’ve barely scratched the surface of Mont Tremblant’s attractions; there’s also ziplining, snowboarding, ice fishing, ice skating, hiking, backpacking, wine-tasting–well, you get the picture. Start with these highlights, and we have a strong feeling you’ll be coming back for more! Colleen Wiseman is a big fan of Mont Tremblant. An avid traveler, she likes to share the best of her outings with others by posting online. You can find her articles on various websites and blogs today.